While following the international climate change negotiations, it soon became apparent that the loudest voices consistently came from countries who were most vulnerable to the impacts of climate change, particularly the SIDS. But even though negotiators shout at the top of their lungs regarding the inevitable plight of their people if concrete actions aren’t taken, it often feels like we are at a complete standstill where meaningful progress is difficult to find. While countries such as Barbados or Fiji offer the most dynamic and passionate calls for action with an astute sense of urgency, their voices are undermined due to lack of leadership and willingness to commit to binding agreements. That’s what makes the theme for World Environment Day all the more relevant - the voices of those who are already loud in SIDS countries need to be amplified; and those who are playing the role of bystanders need to actively engage in conversations about climate change, empathize with frontline communities, and take action in varying capacities to have a shot at mitigating sea level rise. 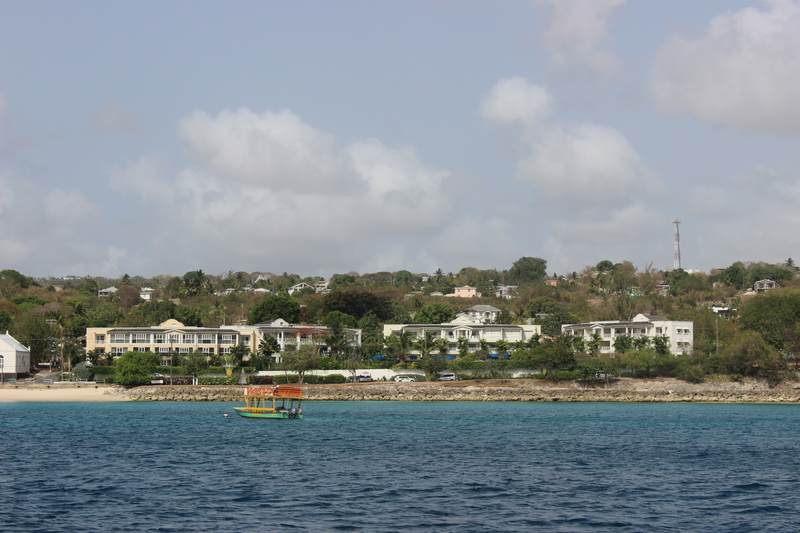 A tiny speck surrounded by the Atlantic Ocean, Barbados is one such frontline community. Over 280,000 people live on the island making it very densely populated (in comparison to my home city of Mississauga, Canada with 668,000 people in the area). As we boarded the bus to go on an impromptu tour around the Scotland district of the island, the dry landscape and the effects of the ongoing drought became clear. It hadn’t rained in these areas in quite some time. Our tour guide took us to various nursery site where locals managed the plants to help grow fruits and vegetables. The papayas you can see below have grown to about these sizes because locals have been manually manually watering each tree consistently. While the picture I am showing displays them to be quite large, most of the other fruits were much smaller. 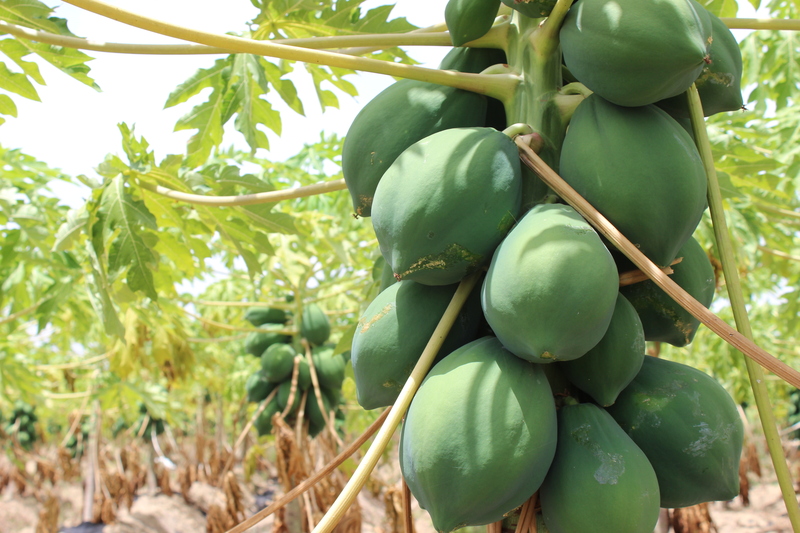 The drought has shifted or limited the growing season for many fruits and vegetables. We were told that while the average annual rainfall hadn’t changed much, there had been significant variability where parts of the island would receive intense rain or extended periods of drought. 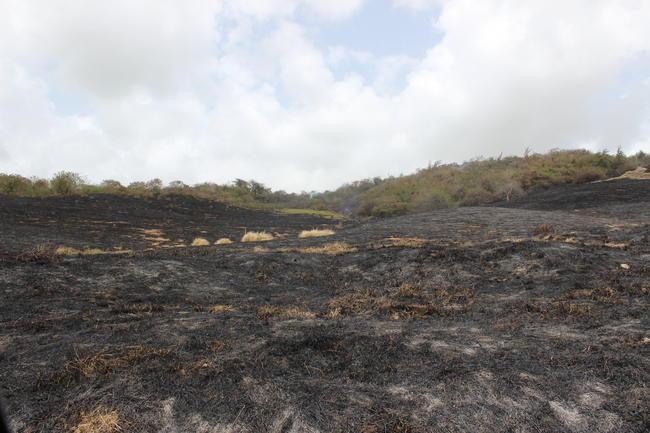 It was also not uncommon to see black clearer lands indicating the crops had been burned down due to grass fires from natural causes or due to human negligence. Most of the areas in the Scotland District are protected where development would need to be approved by the government and from what I understood, conserving the landscapes were prioritized through the National Conservation Commission. Our view drastically changed as we neared the shore and boarded a boat to tour along the west coast of the island. Lush green trees etched the beaches with developments of new house and resort destinations. This stretch of the island was a key attraction for tourists. Locals and experts who had grown up here pointed out the pockets of areas where it used to be covered in mangroves. These trees provided natural stormwater management; all rainfall from the higher elevations of the island near the center trickle down and make its way to the edges of the island. They are also effective as natural barriers from storms, hurricanes, and other natural events. Presently, the mangroves no longer exist and have been removed. There are many ways to look at Barbados. For tourists, the beach resorts and warm tropical weather are alluring features. But I would hope that foreigners do not ignore the conversations on how vulnerable the island is. In fact, tourism can be a way for Barbados to inform and educate the public on the challenges and draw attention to the innovative ways it intends to use to address these obstacles. However, the impacts of climate change will test the island’s resiliency and how well Barbados is able to take care of its natural heritage while providing a healthy environment for its people. After chatting with a few locals, I did get the sense that while they are able to identify that climate patterns have changed based on their own direct experiences. I am hoping to further understand how well Barbadians can connect the dots and effectively see how dependent the factors reinforcing troubling sea level rises are. Signs informing the public to conserve water or other environmental messages did seem to pop up as we moved to different parts of the island indicating that the government of Barbados is invested in educating the public on environmental issues.